I think peonies are one of the most beautiful flowers on the planet. Such lush blooms. With layers of ruffled petals twining to the centre. At first glance, these flowers have a frilly, girlish flair. Yet peonies seem a sensual flower to me. That lushness of the blooms – growing almost dinner-plate size – weigh down the plant with a careless grace. Ya well, that might be true but damn is it ever hard to grow one! All good things come to those who wait. And wait. And wait. Plant lust love doesn’t come easy, I guess. 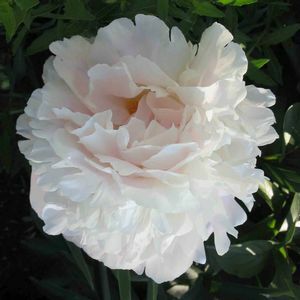 I’ve tried 8 years now to grow a peony plant that will bloom, all to no avail. This year though, this year love will not be so fickle. For Mother’s Day, I was gifted a peony. See this photo? Chocolate chips for the peony. Uh-huh. Sure. Yes, the plant of my unrequited love awaits transplanting. 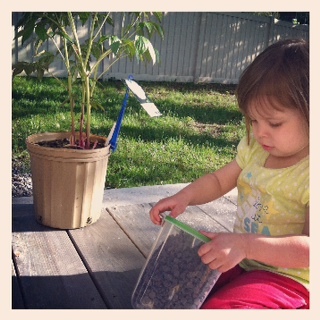 Coincidentally, DD felt the peony needed chocolate chips and so kindly was attempting to give some to the plant. Late Sunday afternoon DH and I planted that peony at just the right height; I watered and tended to it with utmost care. 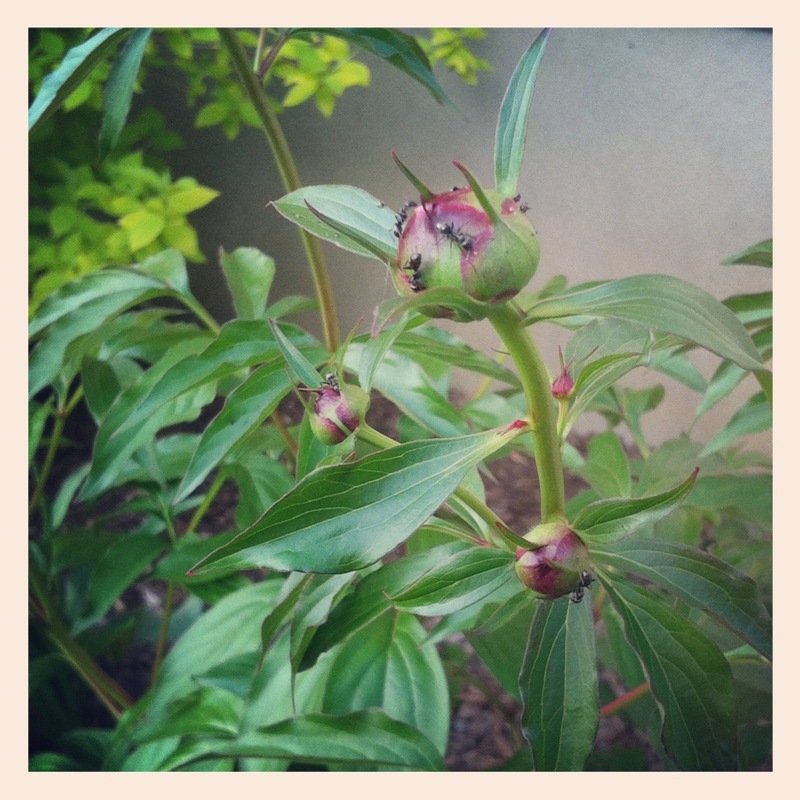 I feel there’s a good chance this plant will bloom – unlike all the other capricious peonies in my past. My chances of building a long-lasting relationship with “Miss Shirley Temple White” are solid because it came with buds on it. 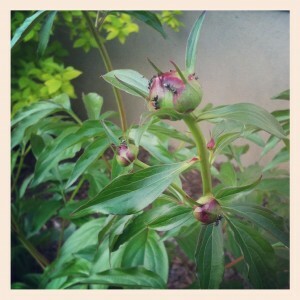 And today – I noticed ants crawling all over those buds – another good sign this peony is committed longterm to blooming. Please keep your fingers crossed for me. If all goes well, I’ll soon have a blooming peony to gush my heart over. Do you have a favourite flower you tried growing in your garden? Did you succeed? That is *so* *cute*. I tried planting tomatoes with the girls, and Boo was far more interested in stealing their dirt (and the pots, come to that) than giving them anything. Your comments about peonies remind me of a quote from What’s Bred in the Bone, by Robertson Davies. Have you read it? I’ll try to dig it up. Sasha, I never read that Robertson Davies book. I’ll have to look up the reference. I’d like to try and grow tomatoes too. But not from scratch. I just couldn’t bear the disappointment if the seed didn’t grow. Peonies are my most favourite flower too! They remind me of home. Good luck!